Project: I-4 / Crosstown Connector | Tierra, Inc.
Florida Department of Transporation District VII designed an elevated limited-access, freeway-freeway system Interchange that extended from Lee Roy Selmon Crosstown Expressway along the west side of 31st Street to Interstate 4. The project has commonly been referred to as “the I-4 / Crosstown Connector” or “the Connector.” The design and construction budget is over $666,000,000. Tierra was responsible for geotechnical engineering design recommendations for three (3) different superstructure alternatives. 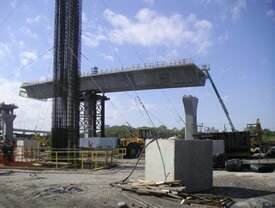 The scope of services included recommendations for 5,000 linear feet of new elevated roadway, architectural gateways, bridge structures including foundation alternatives and a tolling facility supported on Mechanically Stabilized Eart (MSE) walls. In addition, Tierra wrote a Technical Special Provision (TSP) for Settlement Monitoring required for recommending two-stage wall construction. Tierra managed a $999,000 geotechnical budget for a portion of the Connector including over 7,875 feet of Standard Penetration Test (SPT) borings, rock coring and laboratory testing on selected samples. The project was on schedule and within budget for the 4-year duration of the project.